Installing electronic access is never as simple as throwing in a mechanical lock. Not only do you need to install multiple devices, often from multiple vendors, you have to run power and data to the controller. This is not always possible in places where electronic access would be a benefit. 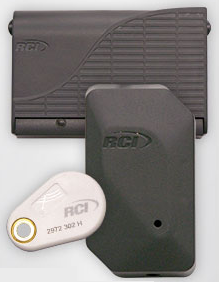 In this note, we examine a new battery powered access control kit from RCI that helps bridge the gap. Rutherford Controls International's ACS-LPP "Low Powered Prox" kit is comprised of an electrified lock, a short-range proximity reader, and a battery powered logic controller. All three components, and a pre-built wiring harness, are kitted together in a single SKU, differing according to which of 6 different locks versions are included: electric strikes (surface, mortise, or fire-rated) or electric-hasp cabinet lock. The unit is powered by either one or two standard sized 9V batteries. The unit is operational with one, but adding a second increases estimated number of cycles to 40,000 depending on which lock is used. A 'low battery' LED and beeper signals when the battery has between 250 - 500 cycles remaining. The primary controller includes power inputs if hardwire power is available. The small 1.75" x 3" x 1" 'mullion style' reader can be installed directly to frames, and the 5" x 3" x 1" controller can be hidden above doors or inside cabinets without occupying substantial space. Up to 250 user credentials can be programmed for use with the kit. The reader works with standard 125 kHZ proximity-style credentials, and can be configured to work with existing credentials meeting that spec, or credentials can be purchased through RCI. The reader/controller is not potted or rated for outdoor use, and is available in a single gray color. A 'programming card' comes with the kit, and is required to make configuration changes including adding/deleting users, defaulting the controller, or even changing batteries. The programming card is key to operation of the lock, and will need to be periodically used during the operation of the kit. Credentials are available in packages of 10 cards (~$40) or keyfobs (~$80). All kits are available through national distribution channels. The appeal of a battery powered solution is present in locations that are hard to read with standard cables (cabinets) or in moveable/remote storage areas like carts or tool trailers. For example, hospital medicine/drug carts are challenge to secure using traditional electronic access control, due to tight onboard spaces and require mobility. The LPP-ACS allows for a portable electronic access system that uses the same assigned credentials already used by hospital staff. Other applications where the LPP-ACS may be useful include cabinets, desk drawers, out-buildings, or even storage boxes or semi-trailers. Not requiring power or networking allows the kit to secure openings too far or too expensive to otherwise reach. Small Size/Battery Powered: The key strength of the kit is that it is small enough to be mounted in cabinets and requires no hard wiring of power for operation. Standalone Installation: In addition to battery power, the unit does not need to be networked for use. Cards are manually enrolled into each controller, but once this is set no other communication between controller or the administrator needs to happen. Existing Credentials: The system can be configured to work with issued credentials, potentially eliminating redundant keys or separate sets of keycards. No Audit Trail: A fundamental feature of electronic access control is 'activity logging' that records who and when a user opened the lock. This log is vital for cross-referencing access to an area, but the LPP-ACS includes no memory for keeping track of this data. No Scheduling: Another basic feature missing from the RCI kit is access scheduling. This feature allows a cardholder access only at certain times, and can help prevent misuse of credentials or 'after hours' accessibility of an area. Not Weatherized: Even though the unit has a broad operational range (0ºF to 132ºF), it is not waterproofed. While the unit can be used outside, additional water-tight enclosures and gaskets will be required. 5 Seconds Only: Another potential showstopper for the LPP-ACS is that it used a fixed 'Door Open' time of 5 seconds. While this is enough time to read a card and immediately open a cabinet or nearby door, it requires that the reader be installed in close proximity to the opening. Likewise, any additional mechanical latches or locks (e.g., overhead door latches) will need to be opened before scanning a card for quick opening. The issue of 'single door' or 'battery dependent' access control is addressed by several other options in the market. One potential alternative to the LPP-ACS kits are 'smart locks' or 'eCylinder' locks that typically are unpowered access controllers. These locks are 'powered' by special keys that contain both credentials and audit logging capabilities. However, unlike the RCI kit, these keys are unique to the respective locks and are quite costly, often costing as much as $80 or $100 per key. (For more details on 'Digital Locks' see our report.) The cost of a 'smart lock' ranges between $350 and $900 depending on hardware type. Another common alternative are 'Cipher Locks', or mechanical keypad locks. Several varieties of units are available, ranging from completely unpowered simplex pushbutton style locks, to units powered by standard wet cell batteries. Unlike the LPP-ACS, these units generally feature audit trail logging and may even accommodate access scheduling, but require the user to remember a specific code for entry. The cost of a keypad lock ranges between $250 and $1500 depending on hardware quality rating, keypad features, and lock functions.